Lowell, May 12, 2018. All special needs children and their families are invited to a story time morning of stories, music, and movement. 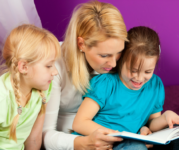 Stay for the entire story time or for as long as your child wants. Meet other families with special needs children.